September 22, 2015 General, Interview, Parental Prepping, Prepper Pete, Prepping Children, Prepping KidsKermit Jones, Jr. I just ha s the honor and pleasure of an interview by James of Disaster Survival Network! If you want to hear about some background, my “why moment” for Prepper Pete, and a great discussion on teaching children all about Prepping… tune in for a bit! You can listen to the podcast by clicking here! April 14, 2015 Interview, Philosophy, Prepper Pete, Prepping Children, Prepping KidsKermit Jones, Jr.
I’ve been fortunate enough to have quite a few radio interviews over the past few years. 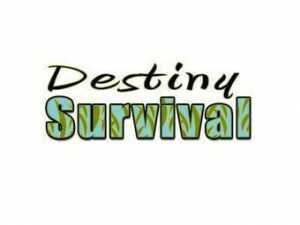 However, few of those interviewers take the time to write out detailed outlines of our time together, so I appreciate the fact that John Wesley Smith at DestinySurvival Radio has done just that! John then goes on to outline our discussion, which means you can easily check it out before (or while) you listen! April 10, 2015 Gun Safety, Interview, Prepper Pete, Prepping Children, Prepping Kidsgunsafety, kidsprepping, prepping, preppingwithkidsKermit Jones, Jr.
That description about sums it up! Being a guest speaker is always fun, and these two definitely had some great discussion questions and points to make. We talked about the Prepper Pete series – past, present, and future. Check out their website, leave a comment, like them on Facebook, and be sure to listen to the show! Our segment starts at about 34:24 and goes for a good twenty minutes to pretty much finish out the show. March 16, 2015 Prepper Pete, Prepping Children, PromotionalKermit Jones, Jr.
We often think about “being prepared” as simply bugging out, bugging in, or perhaps total collapse of society. But the reality is that prepping – and I’m talking real preparedness here – is not an event, but instead it’s a lifestyle. It’s an attitude. And perhaps the one place many of us fail at is in preparing while we’re on the move, in particular, while in our vehicles. I received the following from eReplacementParts and have to say that, even though it’s not a source I’d normally think to read, it is definitely worth sharing! 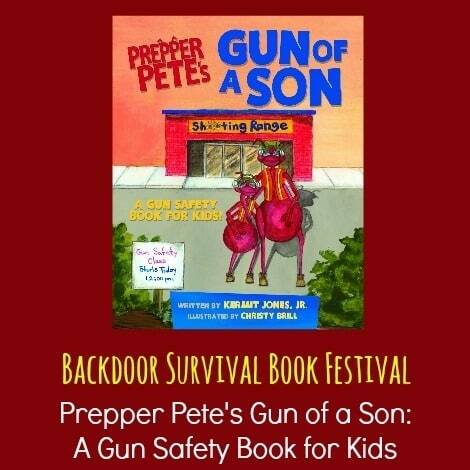 March 12, 2015 Gun Safety, Interview, Prepper PeteKermit Jones, Jr.
Gaye Levy over at Backdoor Survival has just finished out another awesome BDS Book Festival! We missed announcing the 12 Days review, but there’s still four days until completion with a FREE COPY of Prepper Pete’s Gun of Son being given away. “Gun safety is a huge issue not only for adults, but for children as well. The problem, as I see it, is that irresponsible gun use is plastered all over television and in video games. If you think that kids don’t soak that up, then you are living on another planet! In my view, gun safety can never be overemphasized. 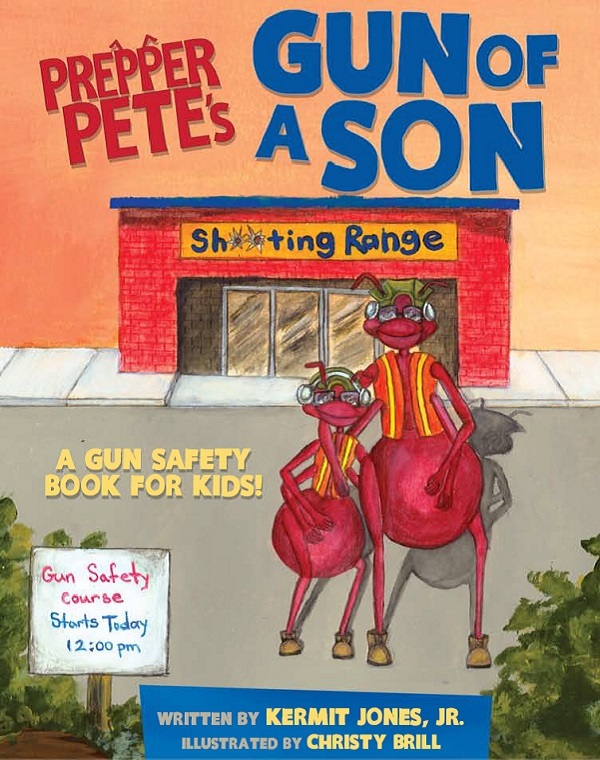 Prepper Pete’s Gun of a Son: A Gun Safety Book for Kids will allow a parent or other adult to introduce the topic of gun safety in a manner that is family-friendly and dare I say it? Interesting and fun. The book promotes gun safety basics and emphasizes that weapons should not be feared but respected and handled carefully like any other tool. Heck, I know plenty of adults, myself included, that need that reinforcement. 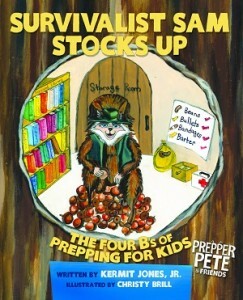 December 28, 2014 News, Prepper Pete, Prepping Children, Prepping Kids, PromotionalKermit Jones, Jr.
Prepper Pete & Friends are pleased to announce the release of the latest book in the series: Survivalist Sam Stocks Up: The Four B’s of Prepping for Kids! Beans, Bullets, Bandages, and Barter Items are the staples of any preparedness plan. Join Prepper Pete’s best friend, Survivalist Sam, as he explores the Four B’s of prepping and many of the fun things your family can do, too! Children will love this fabulously illustrated book that shows them, in a fun and non-threatening way, how to be ready for the unknown. The topic of stocking up doesn’t have to be reserved for prepping and survival! Many activities, from gardening and canning, to first aid and reading, can engage kids of all ages to learn useful skills that will prepare them for the rest of their life. The Four B’s are important in many situations, though sometimes in a different order. Talk to your kids about safe shelter in a storm, or being aware of strangers; take a first aid class with them to learn new skills. Encourage reading and critical thinking. Don’t scare… prepare! Purchase your copy in Paperback or for Kindle today! And if you really want to help us spread the word, please leave a review on Amazon when you can! Visit www.PrepperPeteAndFriends.com for more information. *No Kindle? No Problem! Simply download the Kindle Reading app for your favorite mobile device! September 19, 2014 Gun Safety, Prepper Pete, Prepping Children, Prepping Kids, PromotionalKermit Jones, Jr.
Kamel Press has released a gun safety book in a series aimed at helping children become more prepared for various situations. CHESAPEAKE, Virginia – (September 18, 2014) – According to the National Rifle Association, there are 300 million guns owned in America, and that number continues to climb by around 10 million each year. As a result, gun safety, especially where children are concerned, has become more important than ever. A new book series aimed at helping kids to be prepared for various situations has made a course change and its focus is on helping raise more awareness regarding children and gun safety. 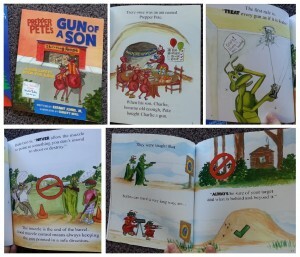 The book, titled “Prepper Pete’s Gun of a Son,” walks kids through gun safety, one page at a time. 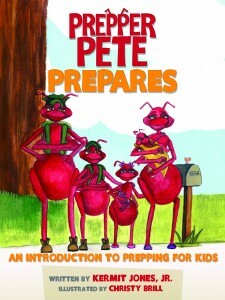 The book is the third in a series starring “Prepper Pete” who is an ant and survivalist. Curious and engaged, he explores and takes on issues that could be threatening, yet wisely prepares for them. 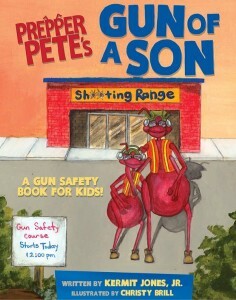 In “Prepper Pete’s Gun of a Son,” he buys a gun for his young son and they set out to learn a variety of important safety skills, such as holding and shooting correctly, what to do if you find a gun, how guns should be safely stored, about never pointing it at something you don’t intend to shoot, and more. The latest book in the Prepper Pete Series! Jones has created the book as an entertaining tool that can be used to help elementary-aged children learn more about gun safety. While it’s the starting point of an important discussion, he is clear that it is not a replacement for attending a gun safety course. Focusing on the idea that “knowledge is safety,” the book helps children become more aware of what to do if they are around a gun in order to prevent accidents. Jones also has a personal reason to want to increase gun safety when it comes to children; he is a father to four young children under the age of 12. A 1998 graduate of the Naval Academy and former Surface Warfare Officer, he currently serves as a Chaplain in the Navy Reserves. 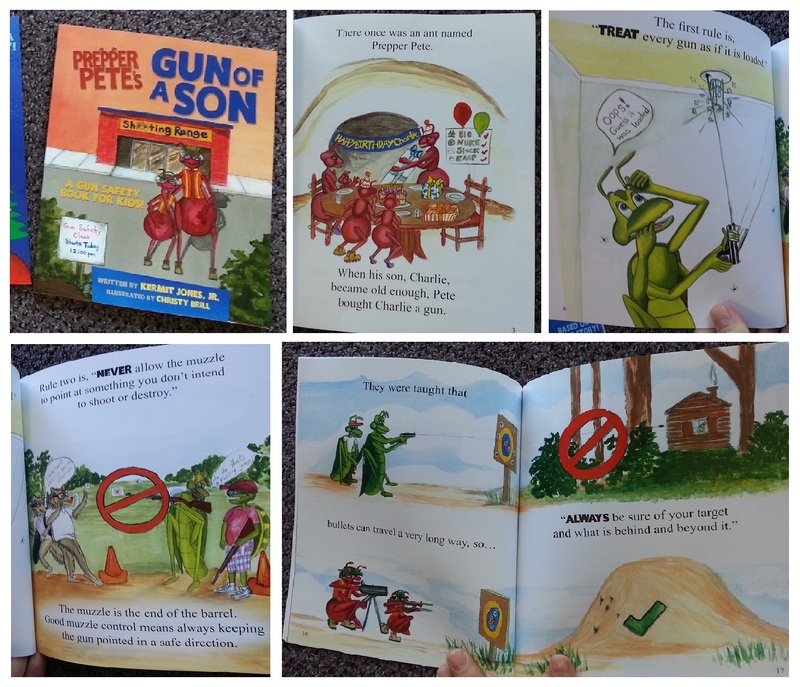 Prepper Pete’s Gun of a Son: A Gun Safety Book for Kids! April 17, 2014 Gun Safety, News, Prepper Pete, Prepping Children, Prepping Kids, PromotionalKermit Jones, Jr. Kids and… guns? Absolutely! Why? Because we should be teaching our children about safety – not trying to scare them! If knowledge is power, then in the case of firearms, “knowledge is safety.” Familiarity with guns for kids often helps avoid the “forbidden fruit” syndrome, which can create a safer environment. When they are an appropriate age, work with your kids to familiarize them with firearms, and always stress the importance of gun safety! “Teach Safety, Not Fear!” – that’s our motto when it comes to guns. We teach them about other dangers – electricity, knives, matches/fire, etc… and that should be the same reasoning we teach them about guns… so they can be safe! And let’s face it… your views may not matter when they visit a friend’s house, so teaching them proper safety will help keep them safe even when you’re not around. IMPORTANT: Prepper Pete’s Gun of a Son is only intended to be used as a launching point of discussion with children. It is not intended to be a substitute for an actual firearms safety course. Seek out information and a local safety course in your area, and attend with your child to demonstrate to them the importance of gun safety. Teach the “Gun Safety Rules” as well. Kids should ask a grownup to help print and sign the “Gun Safety Contract” like the one Charlie and his dad, Prepper Pete, signed. And, as Prepper Pete says, “There are many toy guns out there, but remember that real guns are not toys! Guns can be very dangerous if you are not careful. Even airsoft and BB guns can be dangerous and you should follow safety rules!” Remember that “good practice makes good habits” and you should always practice safety! Birthdays, Christmas, Fourth of July!? Grab a copy in Paperback (Amazon or B&N) or eBook (Kindle) (got a Nook or something else? Don’t worry… you can download the Kindle reading app). Check other the other books in the series, as well! Making progress towards Gun of a Son! February 13, 2014 News, Prepper Pete, PromotionalKermit Jones, Jr.
“Gun of a Son” is approaching release! Christy just went though all the ants perfecting them this morning and is going to go back though all the guns. We also made it through the “Big Editor” (Kari) who helped to smooth the order and really improved flow.